Finding the perfect bed for my daughters bedroom proved to be a very difficult task. We had already bought a new desk, dresser, bedding and accessories but the room was feeling character-less. Her original white headboard was lovely but too small for the space and didn't make much of an impact. I wanted to add in some character to the room so I made a DIY playful house bed, but it was too tall and felt bulky in the small space. We then tried to use a day bed without a headboard and footboard (I got for free) for a little while as I searched for the next option and hopefully last. While my daughter and I were out shopping one day we stopped by a local secondhand store and I spotted this beautiful bed... It had great bones, a dark cherry stain and was missing it's side rails... I asked the price and the lady said I could have it since there were no rails. I immediately snatched it up and took it home with me. The cherry stain wouldn't work in the space so I started to sand down the headboard and footboard. I thought I would paint them but after I had sanded them down a bit, they had magically turned into something so beautiful and full of character that I decided all at once that I would leave them as is. For the side rails, I couldn't use the bed frame I already had because of a size difference so I bought some 1x6's and 2x2's and screwed them together to make the side boards. Then I used 1x4's as slats to hold the mattress up. Now, we have this beautiful, unique piece that brings in so much warmth and character to my daughters room. I love that it cost me less than $20 (wood for the side board) for this bed, it was totally worth the wait. Did you see that beautiful gate hanging on the wall? I got that back in March when my parents were cleaning up their backyard. I love having a meaningful piece like that in my daughters room. 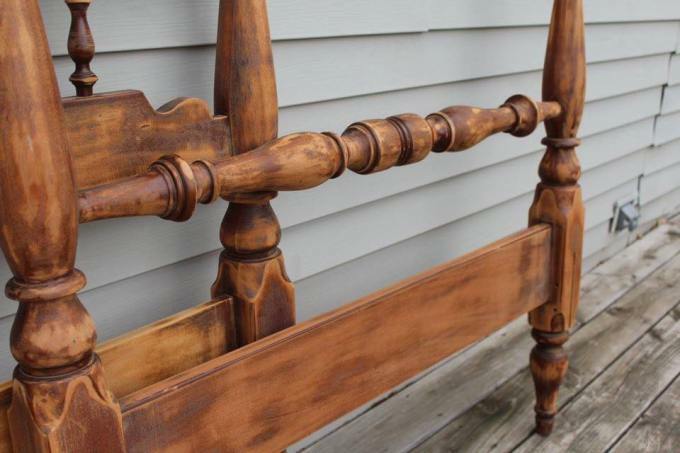 I plan on turning her old white headboard into a sweet little bench seat and the house beds wood has already been reused on another project so there is no waste here. Which bed is your favorite from this post? Leave me a comment below to answer, I'd love to hear your opinion.